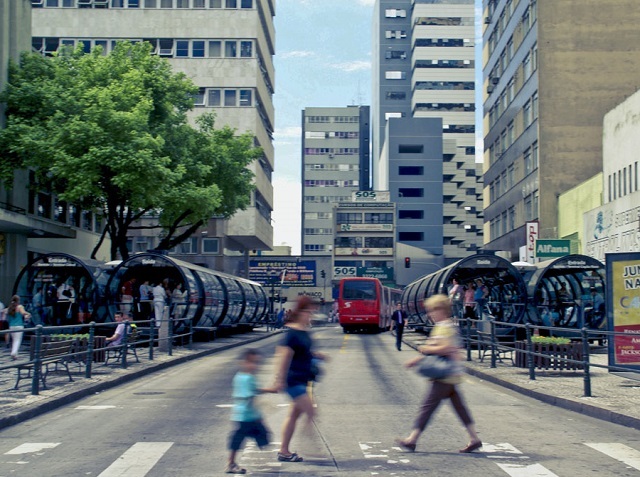 Cities worldwide can become smarter by using technology to make public transport more efficient, sustainable, and effective at meeting the mobility needs of their residents. Photo by Cristina Valencia/Flickr. What are smart cities? While there isn’t a standard definition, consensus is growing around the idea that smart cities utilize technology to foster green development, innovation, and new forms of citizen participation. Smart cities currently enjoy a strong positive image, with 89.6 percent of the population in ten U.S. and Canadian cities in favor of smart city development. Globally, smart cities are buzzing, as India’s Prime Minister Narendra Modi announced last year an initiative to build 100 smart cities by 2024. To further explore this concept on a world stage, the Smart City Expo World Congress—held March 25-27, 2015 in Montréal, Canada—brought together public administrators, international experts, and business leaders. The open and diverse discussion allowed participants to explore the concepts surrounding smart cities, like energy and climate change, urban resilience, open government, and sustainable mobility. Much of the discussion revolved around the idea that smart cities are not truly sustainable unless they equip their citizens with the tools they need to contribute to civic life. The conference emphasized putting people and citizen participation at the center of the smart city movement. Keynote speaker Gil Peñalosa reinforced this point, indicating that smart cities aren’t just about technical solutions—they’re about serving people. New ways of acquiring and processing data, utilizing open-source mapping platforms, and generating powerful data visualizations are already empowering communities and helping planners improve zoning, street design and transit performance. For example, Assaf Biderman, Associate Director of the MIT-SENSEable City Lab, shared some of the amazing ways open information can provide data on transportation patterns. Similarly, the transit specification format GTSF helped researchers map Nairobi’s matatu system, making it open and available to the public for the first time. Technology can help inform citizens about planning in their communities and also facilitate citizen participation in policymaking. Funding for Vancouver’s transit system, for example, is currently under review by referendum. Throughout the process, the city has used different online and social media platforms to inform residents about updates and obtain feedback. Another example is Indore, India’s bus rapid transit system and its extensive use of social media to involve the larger community at every level of the decision-making process. Providing people with real time information about departure times helps improve transit operations. Transit agencies—like STM in Montréal—are developing a much closer relationship with their users, since data now comes in through a variety of sources thanks to new technologies. Utilizing social media and crowdsourcing can help transit agencies better respond to citizens’ mobility needs. Transit apps like Moovit, used in more than 500 cities in industrialized and emerging economies around the world, not only help users navigate the city, but also provide opportunities to get feedback through user ratings and performance metrics. Cities need to embrace a comprehensive approach. Focusing exclusively on technological approaches—like solely increasing the number of hybrid and electric vehicles—will not be enough to achieve the significant reduction in greenhouse gas emissions required to meet the two-degree target recommended by scientists. Technology-centric solutions may result in intense traffic congestion or high traffic fatalities, despite being more environmentally sustainable. Instead, technology needs to be integrated into a greater framework for sustainable mobility and urban development in order to tackle persistent challenges beyond transport emissions. Toronto’s waterfront development, for example, embodies all the principles of sustainable, smart development and is one of the most interesting redevelopment plans in the world. Technology offers nearly endless possibilities for sustainable cities, from planning and user information, to electrification of vehicle fleets and smart grids of renewable energy sources. However, it’s important to expand our thinking, and to recognize the bicycle as another technology of the future. Bicycles will likely have the greatest impact on mobility in the next five to ten years. They are already well established as the main mode of transport in cities like Copenhagen and Amsterdam; and they are growing fast in the U.S. and in Latin America. Bikes have become an expression of a new lifestyle for younger generations. Even though modern bicycles are almost 200 years old, they are a clean, effective, healthy, and fun mode of transport. Safe bike lanes and parking, integration with transit, tech support—like electronic assistance—and even technology-enabled bikesharing systems can help establish bicycles as an essential mode of transport in smart cities. These five ideas are useful not just for cities in industrialized countries, but also for the rapidly growing cities of the global south. Cities everywhere face formidable challenges, but technological changes present immense opportunities for tackling these seemingly intractable issues. Smart cities can utilize these technologies to create safe, sustainable, livable and resilient places for people.